A stretchy material that is much easier to tie egg patterns with than the old egg yarn. Comes in many vibrant colors that won't fade. 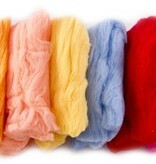 McFlyfoam also makes wool headed streamers that are easy to tie and trim.